Taken at the International Space Station by astronaut Aki Hoshide (Japan), this awe-inspiring self portrait brings into one frame "the Sun, the Earth, two portions of a robotic arm, an astronaut's spacesuit, the deep darkness of space, and the unusual camera taking the picture." You'll want to click the image above (or this link) to view the picture dubbed "Orbiting Astronaut Self-Portrait" in a worthy larger format. 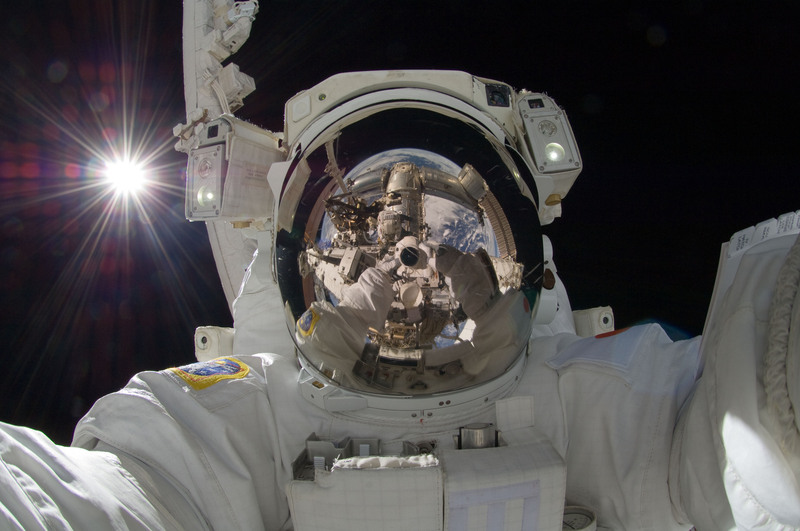 Find other self-portraits taken in space here and here. And visit NASA's Astronomy Picture of the Day for more striking images each and every day. If you look closely at the large version of the picture…the camera is a standard digital SLR covered with some sort of anti-radiation covering signified by the two letters “DX” on the front of the camera. Thanks for sharing this! Truly a great pic! It’s clear that this picture was taken with a hand-held SLR, NOT with the “unusual camera” referred to in the text (the ISERV camera, which can be seen here: . Also, I’m surprised that neither NASA nor the Open Culture editors noted that, in addition to the other objects in the photo, there is another astronaut, Sunita Williams, seen from above, visible just above and to the left of the camera in the center.